You may remember him predominantly as the irascible Lou Grant from “The Mary Tyler Moore Show” and Mr. Grant’s own hour-long series, but Ed Asner’s never been lacking for acting gigs, and that’s a situation that continues even now. At the moment, Asner can be seen in theaters as part of the ensemble cast of “Gigantic,” and this summer, he’ll be providing the voice to Carl Fredericksen in Pixar’s “Up.” Bullz-Eye spoke to Asner about both those films, his reuniting with Zooey Deschanel for “Gigantic” (they were also in “Elf” together), and, of course, we couldn’t resist bringing up Lou Grant at least briefly. Fair warning: Mr. Asner discusses a spoiler to “Gigantic” within the course of our discussion, so if you have any intention of seeing the film, you might want to wait until you do so before reading on. 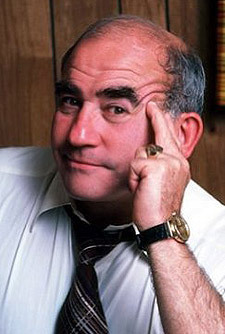 Bullz-Eye: Hi, Mr. Asner. How are you doing? EA: Fine. How are you? BE: I’m doing well. It’s a pleasure to speak with you. EA: Oh, we were in Virginia recently. BE: Oh really, for what? BE: Oh, excellent. Well, I’m about four hours away from Charlottesville, but I get up there every once in awhile. EA: We had a lovely tour. BE: You and I actually got to speak last summer during the TCA tour, after the Hallmark Channel’s luncheon. On his "Gigantic" character doing 'shrooms: "I have to admit that I personally can not comment, because I’ve never tried them. From what I hear, I have something to regret in that respect. But I thought the man had class." EA: Well, I haven’t changed much since then. BE: Well, that’s good, because I enjoyed the conversation. So I watched “Gigantic” this morning. BE: I enjoyed it. I’m afraid to let my wife watch it, though, because she’s going to be left with too many questions. Like, for instance, why did he want to adopt a Chinese baby? EA: Well, I won’t answer for him, but I think because there are so many of them. Aid the world by helping depopulate China. And the fact that it was a girl…China was going through that abortion, termination of girls for a while there. I think they stopped that, more or less. Do you remember that? EA: So it’s nice to save a girl. BE: I have to say that, as far as your work in the film, it was pretty darned odd to see you doing ‘shrooms. EA: (Laughs) Well, I have to admit that I personally can not comment, because I’ve never tried them. From what I hear, I have something to regret in that respect. But I thought the man had class. BE: Oh, absolutely. I thought the concept alone of doing ‘shrooms in order to go find ‘shrooms was great. And I can’t really explain why it was funny that your character made birthday piñatas in the shape of famous dictators, but it definitely was. EA: Yeah, you know, I should copyright the idea, if nobody else has. It’s a great idea. Why don’t they do it? But I think Kaddafi was used, was he not? So we already have to update the film, because he’s now a friend. BE: The film had a lot of those little eccentric touches. I think it’s one of the reasons that I enjoyed it as much as I did. Now, this is actually your second film with Zooey Deschanel. EA: Well, at least off-camera I had time I spent with her. She was lovely to be with. I had no time at all with her in “Elf”. BE: Oh, I thought that she was in at least one of the scenes toward the end with you. BE: Yes. (Hesitates) Or maybe not. EA: It was all rushed. I can’t remember. But she’s a sweet, lovely talent. BE: Matt Aselton was a first time director when he stepped behind the camera to helm “Gigantic.” Are you somebody who enjoys working with new talent? EA: I don’t mind new talent, as long as they’ve got talent. He certainly has it up the wazoo. Of course, he directed many commercials, I gather. Some of our top directors, I guess, these days have come out of commercials. BE: Well, you seem like someone who would be interested in helping to train the next generation, as it were. EA: I want to win them. It’s like the gal who used to keep gold-plated Boy Scout badges in the closet. She knew what was coming. BE: So how did you enjoy working on the film? EA: I had a lovely time. I don’t necessarily love New York, but the people involved… I loved the talent. I was surrounded by talent. I loved meeting and working with Paul Dano. I really loved that mysterious quality of his. My other two sons were a delight to be with. They were fine, fine guys. Ian and…I’m afraid I can’t even remember the second one’s name! (Laughs) Is it Robert? BE: It is. Ian Roberts and Robert Stanton. EA: And it was my second time with Jane Alexander. BE: I was going to ask if you had worked with her before. EA: I played her father in a movie we made called “Friendship in Vienna,” which we filmed in Budapest. BE: Well, you’ve come a long way, working your way up from father to husband. EA: Yeah. I thought that scene (in “Gigantic”) with her on the balcony was maybe the richest scene in the whole movie. BE: That was probably my favorite as well. So when you look for scripts, or when you choose scripts, do you look for scenes like that, whether they are yours or not? 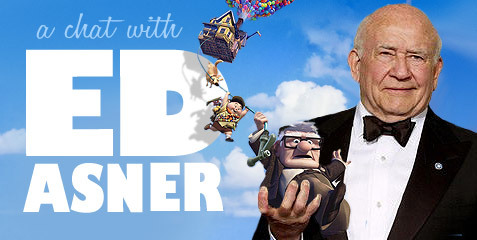 On "Up" having a senior citizen as its main character: "A lot of seniors automatically would probably stay away from the usual 'Ratatouille' or 'Wall-e' or whatever, but the fact is that this is not only going to bring the little ones in, it’s going to bring the older guys in." EA: I don’t look for other people’s scenes. (Laughs) No. It certainly helps sell it but…I enjoyed mine enough to know that I could have fun doing it, and that it was a…it was a very pleasing character and genre. The whole movie was nice, and I knew John (Goodman) would cut a rug with his character. BE: Yeah, he was great, too. EA: Let me ask you: how did you feel about the mysterious stranger? BE: That was another reason I was going to keep my wife away from the film: because she would just be completely confused. “I don’t understand, why was he there?” It was a unique, and I didn’t hate it, but I just thought it was…odd. EA: Stumped you, didn’t it? BE: Yeah, absolutely. I was just kind of mystified, I guess. EA: There is a term, almost a carny term, used for stuff like that. What is that called? Do you remember, by any chance? Damn I wish I could remember. Some inexplicable thing that people would automatically include in their presentation. (Writer’s note: Maybe he’s talking about a MacGuffin, but that’s my only guess.) I argued against it. I argued against above all killing the guy, even though he had tried to kill our hero, because…how can you walk on and ignore it? EA: Yeah, and not explaining it. That poor little Chinese girl’s life is going to be forever clouded. So I questioned it and talked about doing something to clarifying it and…to no avail. BE: I think that’s going to be the question that is left in most everyone’s mind at the end of it: what was the deal with that guy? EA: Yeah, yeah. It’s a puzzler. It was the pea under my mattress. BE: I gotta tell ya, I’m as excited about seeing this movie as any other summer blockbuster. EA: And I think you’ll be rewarded. BE: It was gorgeous, everything that I saw. EA: Did you wear 3-D glasses? BE: No, they showed us the standard version as opposed to the 3-D.
EA: Yeah, that 3-D crap bothers me. But I hear that the glasses they are now using are vastly superior to anything we use to wear. BE: Well, even without the glasses, it just looked gorgeous. EA: That’s nice. Yeah, that’s nice. BE: So now what I’m wondering, though, is if the part was written for you, because it certainly could have been. Or did you actually audition? EA: Well, I can’t say I auditioned. After I was cast, I found out that the two directors, Pete Docter and Bob Peterson, had gone to San Francisco and seen me in a one man performance, a reading performance about a Holocaust survivor going through dementia. I gather that was their clincher to casting me, which I didn’t know until I started doing the show. I never read for them or anything. I was delighted to get the gig. BE: Do you think people are making mountains out of molehills by saying, “Oh, it’s a real risk to put a senior citizen as the lead character in an animated film”? EA: Oh, Jesus Christ. First of all, what’s our population rated at now? Seniors, a lot of seniors, automatically would probably stay away from the usual “Ratatouille” or “Wall-e” or whatever. But the fact is that this is not only going to bring the little ones in, it’s going to bring the older guys in. BE: My first thought is that kids have grandparents, so why wouldn’t they be in to seeing someone like their grandpa as the hero of a film like that? "I loved journalism until the day my journalism teacher, a man I revered, came by my desk and said, 'Are you planning on going into journalism?' I said, 'Yeah.' He said, 'I wouldn’t.' I said, 'Well, why not?' He said, 'You can’t make a living." EA: Yeah, yeah. I also like the fact that they made the kid Asian, which he was in real life. BE: Speaking of Comic-Con, I read today that you’re a member of the Comic Book Legal Defense Fund. BE: The Comic Book Legal Defense Fund. EA: I think that was a quickie okay I gave. (Laughs) I forget what that’s about, but, yes, I’m in favor of comic books. BE: Well, I’m not surprised. I mean, I know you’ve contributed voices to the “Batman” cartoon, and “Spider-Man” and a couple of others, too. EA: Granted, it would’ve been far better if I had read the actual classics, but at least it introduced me to the classics. BE: Do you remember how you reacted when the decision was made to spin Lou Grant off into his own show and to make it a drama rather than a comedy? BE: What do you think about the state of journalism today? EA: Horrible, horrible. I bleed for every good journalist, for every dedicated journalist at the swamps that surround them. It was never a rose garden, and it’s nothing but…you don’t even get the roses now. You know, I’m sorry for any dedicated journalist. BE: Last one: where does the situation with the Screen Actors Guild stand at the moment? EA: I wish I could tell you. There’s a blanket of information…a smothering of information is now current. I’m participating in a group petitioning the Justice Department to step in and force SAG to let the members vote on the offer before management. After 60 days, they can then proceed with that offer, not having been commented on, agreed to, or denied by the membership. So that’s where I stand. I think that too many of our money doctors, along with AFTRA, along with New York, along with the branches, have carved what was a beautiful, great union into a hash, and I am disgusted and sickened. And that’s about all I have to say on that subject. BE: Well, I’m sorry to end it on a down note, but it has been a pleasure talking to you. EA: Well, and I you. I certainly enjoyed your queries.